Tri-County Animal Hospital is equipped with an advanced surgical suite and utilizes a board certified surgeon who can be scheduled to perform advanced orthopedic surgeries right here at our hospital. 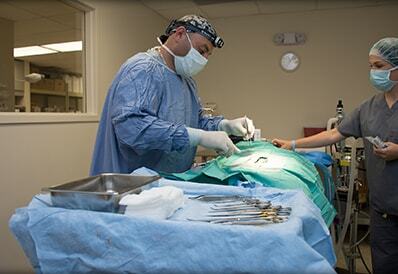 Orthopedic surgical procedures focus on repairing the patient’s bones and joints. Whether your pet is experiencing pain from a chronic joint condition or has recently suffered an injury, our veterinary surgical team can perform a variety of orthopedic procedures. With the help of our in-house laboratory and diagnostic equipment, we are able to diagnose your pet’s condition, correct the condition, and provide follow-up care to improve the quality of your pet’s life. Your pet’s pain relief is important to us. Our veterinarians will develop a unique and comprehensive pain management protocol for your pet to help keep them as comfortable and pain-free as possible before, during, and after surgery. Visit our pain management page to learn more about our pain management protocols.